To be completely honest with you I had not heard anything about The Vessel before this trip. I had noticed a few posts popping up on my Instagram feed and that´s how I became aware of it. 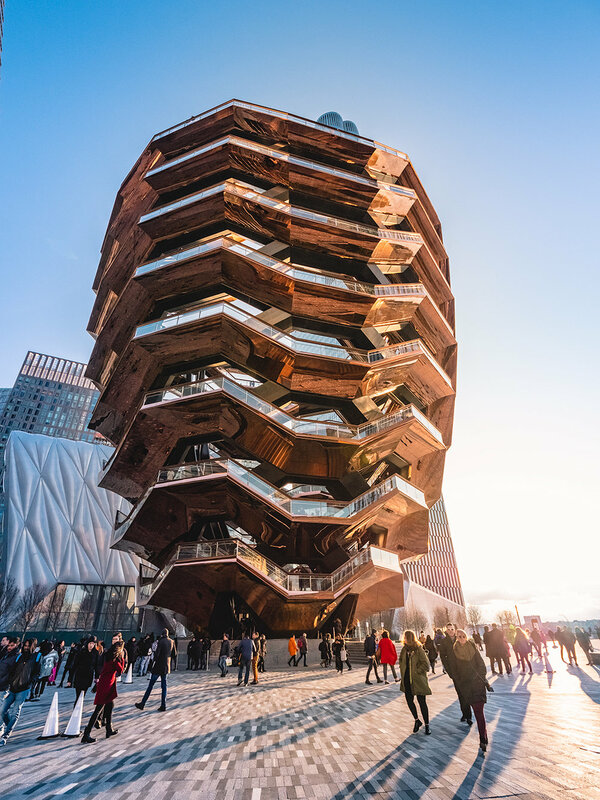 If you´re not familiar with New York City´s newest attraction, The Vessel or Hudson Yards, let me tell you a little bit about them. Hudson Yards is New York´s newest neighborhood and is located on the lower west side of Manhattan in the Chelsea and Hudson Yard neighborhoods, between 30th and 34th Streets and 10th and 12th Avenue. It is the largest private real estate development in the United States by area, so for those of you that have been complaining about how this money was spent on such a useless landmark, well, it´s not public money. The actual Vessel, as it is temporarily named, was designed by British architect Thomas Heatherwick. It is the centerpiece of Hudson Yards and it sits on a 14 acre public plaza. 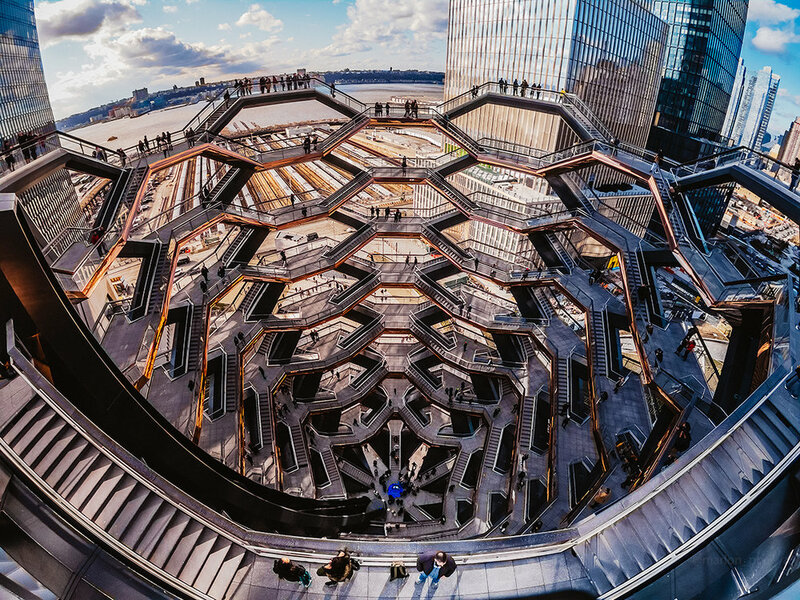 I say it is temporarily named, because according to the Hudson Yards website they are looking for suggestions on a new name and are leaving it up the public, so we´ll see what they end up naming this structure. Behind the Vessel is a 7 story shopping mall called “The Shops” that has over a 100 shops, and right beside it is a new cultural/art center called “The Shed”, that will open later on this year. The Vessel is 150 feet tall (16 stories) and it consists of 154 staircases, 80 landings and almost 2,500 steps. It is made up of 87 carbon steel pieces that were prefabricated in steel plant in Monfalcone, Italy and then shipped to the U.S. The Vessel is open Monday through Sunday from 10:00 a.m. to 9:00 p.m. and entrance is free. There are two ways to get tickets. You can book in advance through the Hudson Yard website. I actually booked mine the night before and had to wait about 30 minutes to finish the booking because once you get on there, they put you in a queue. Keep in mind, wait times may vary and they only book for two week time periods. The other way of getting tickets is to show up the same day and see what time slots are available. Same day booking opens up at 9:30 a.m. EST. I recommend you book ahead of time just in case they are booked up or you may end up having to wait for a time slot later on in the day which can be a few hours. Upward view of the Vessel from the middle marked point. Upon arriving, have your mobile pass ready (if you booked in advance) to enter. I went in the winter and it was extremely windy as you can see in my video down below. I would check the weather ahead of time and dress accordingly. As I had mentioned, I had seen the Vessel on Instagram, but it was much nicer than I had expected although smaller. It is a really nice polished copper-colored (rose gold color) structure and it almost looks like a vertical maze. The tourists visiting actually looked like little ants roaming the structure. I took a few pictures and headed inside. When you step in, there is a marker right in the center of the vessel, you can’t miss it as everyone surrounds it patiently waiting to take a picture. This spot is smack in the middle and when you look up from this point you have a great view/photo. It’s very easy to maneuver and you can get to the top fairly quickly. Although, I really took my time because every flight of stairs you go up, you get a different view or perspective. Interesting fact, walking up and down the Vessel in a circular path, you will walk one mile. There is no time limit on your visit, so take your time and enjoy the experience. After all, this structure was designed to climb, interact and enjoy the views. Climbing up the Vessel wasn’t too bad, it was really cold and windy though, and the views on the way up were nice, but it wasn’t until I reached the very top that I really enjoyed the views. Looking downward you see the beehive shape structure with people walking all over the place. If you look up you get a nice view of the new skyscrapers, and looking outward is a view of the actual Hudson Yards and the Hudson River with New Jersey across the river. There has been a lot of controversy and strong opinions about the Vessel, but don’t get caught up in the negativity about it. I’m not an architecture expert, but it’s an interesting structure and it’s another attraction to see in New York City for free, so why not?. If I went around the world looking at what attractions cost or if I agreed with their purpose, I’d never see half the things I see when I travel. Live and let live!